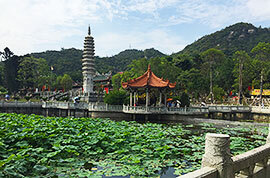 How to Plan a Xiamen Tour? Xiamen, a port city and a sought-after destination on the southeast coast of China, is blessed with beautiful landscape. Strolling around Gulangyu Island, you can unwind with a captivating harbor scenery. A day trip to the Hakka Tulou exposes you to a completely different culture. Taking a short high-speed train to Mount Wuyi, a world cultural and natural heritage site, makes a richer Xiamen vacation package. 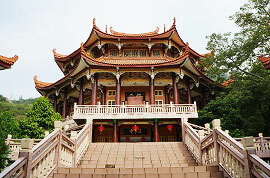 With our private Xiamen Tours, you will get an authentic travel experience, like a real insider. 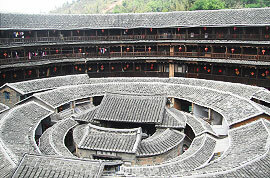 The Hakka Tulou, a UNESO World Heritage site, is famous for its unique architectural style, ingenious structure and design, with no parallel anywhere else in the world. This kind of earth dwellings has many different shapes, such as round, square, rectangular, semi-circular, pentagonal and octagonal. They are also loaded with multiple functions, such as fire resistance, earthquake resistance, defense, etc. Even more amazingly, the Hakka Tulou is cool in summer and warm in winter with natural lighting and ventilation. The Yongding Tulou Cluster and the Nanjing Tulou are rated the most brilliant Tulou examples. 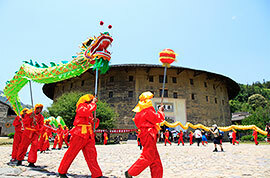 It takes 3 hours to drive from Xiamen to the Yongding Tulou Cluster and 2 hours to Nanjing Tulou. 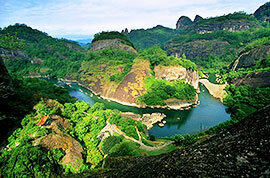 With a typical rose-cloud landform, Mount Wuyi is a favorite scenic spot and summer resort for tourists coming to Xiamen. If you have plenty of time, you may consider including a 2-3 days side trip to Mount Wuyi by taking the convenient D-train from Xiamen. There are 25 D-trains daily, and the journey is about 3 to 3.5 hours. 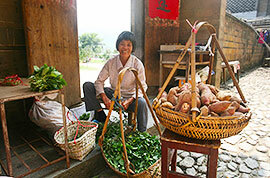 You can climb the mountain, take a boat, and taste Da Hong Pao tea in addition to communing with nature. Xiamen enjoys convenient rail, water and air transportation. It takes only 4 hours by high-speed train to both Huangshan and Shenzhen. Some international cruise ships also call at Xiamen port. There are frequent flights to major cities like Beijing, Shanghai, Hong Kong, Guangzhou, Xian and Chengdu. If you are going to visit these cities from Xiamen, please contact us to tailor-make your Xiamen tour itinerary to your liking. With a mild climate, neither too cold in winter nor too hot in summer, Xiamen is a good place for a vacation most of the year. March to May and October to November are particularly inviting time to visit the city since the weather is usually fresh and sunny with blue skies and pleasant temperature. Although it is a bit cool from December to February, visitors can enjoy sightseeing in a relatively peaceful ambience. One may consider avoiding travelling around August since typhoon happen occasionally. Xiamen greets you all year round! I will take a cruise ship to arrive in Xiamen and stay for one full day. Where can I visit? You can visit the highlights of the city. Gulangyu Island should be the first option. You will visit the Piano Museum, Shuzhuang Garden, etc. Riding a bike along the Island Ring Road will also be a good experience. After that, you may visit the Nanputuo Temple and walk freely in Zhongshan Road.